A closet can be a cluttered mess or a well-organized storage space, depending on how you approach it. 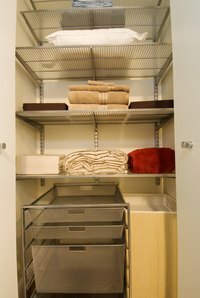 If your closet lacks organization, you may want to take advantage of unused wall space by installing shelves. Shelving is available in all shapes and sizes, and finding the shelves that best fit your space is a simple matter of assessing the space and determining how it can best fit your needs. Most people can install new shelves quickly and without much trouble using some common tools. Measure the closet with a measuring tape and note its width and depth. Determine a comfortable height for your shelf or shelves and account for any dressers, chests or similar furniture that will be in the space. For multiple shelves, estimate the height of the clothing stacks or other items you will keep on the shelves to determine the vertical space between each shelf. Locate the wall studs in your closet with a stud finder. Make a small mark on the wall directly between the two edges of the wall stud with a carpentry pencil. Hold a level to the wall with its top edge touching your pencil marks and adjust their height as needed until they are level. Choose your brackets according to your needs. For adjustable shelving, use a combination of brackets and standards. The standards attach to the wall and have vertically spaced slats or holes where the brackets rest, allowing you to adjust shelf height by relocating the brackets higher or lower. L-shaped brackets are another option. They vary widely in appearance, from unadorned metal to ornate, and from large to small. Invisible, or floating, brackets attach to the wall and support the shelf via hardware that slides inside the shelf, or extends horizontally from the wall, and is concealed by the installed shelf. In general, larger brackets made from stronger materials support more weight than smaller brackets, or brackets made of wood or plastic. Drill pilot holes through the wall and the studs into each of your marks. Use a drill bit with a slightly smaller diameter than your wood screws to create holes that will prevent the wood from cracking, but will still be small enough for the screws to grip the wood around them. Hold each bracket against the wall, lining its top hole up with your guide hole, and drive a screw through each hole into the wall. Straighten each bracket as necessary, and drill guide holes through any remaining holes in the brackets. Screw the brackets securely to the wall. Obtain wooden shelves that fit your desired dimensions, or cut shelving wood to size. Use a hand-held saw, cutting slowly and carefully to make straight lines, or use a table saw to create straight cuts more quickly. Rest your shelf on the brackets. Mark and drill shallow guide holes on the underside of the shelf where the brackets will attach. Secure the shelf to its brackets with short wood screws to avoid penetrating the top side of the shelf. Measure the back and side walls of the closet and cut a support out of 1-by-3-inch lumber to fit your space. Make one back wall support the entire width of the closet and cut the other two to your desired shelf depth, minus the thickness of the back wall support. In this example, assume the back support is 3/4 inches thick, so subtract this length from the total length of each side support. Locate and mark the wall studs with your stud finder and pencil. Make a horizontal mark over each stud at the height of each shelf you plan to install. Use your level to check the height of your marks and adjust them as necessary to ensure they are level. Hold the back wall support in position and drill a pilot hole at each mark through the board, the wall and the stud behind the wall. Nail the support to the wall, then line the side wall supports up with the rear support, and nail them to the wall the same way. Install supports for additional shelves at their respective desired heights, then purchase or cut wooden shelves to fit the width and depth of the supports. Lift each shelf into position at an angle and twist it into a horizontal position over the supports before lowering it into place. To remove excess glue when edgebanding use mineral spirits or paint thinner. You may want to take your cut list to a local cabinet shop and inquire about their pricing. If it's something they could do in a couple of hours or less they may not charge an arm and a leg.